While we are proud of the journey that got TaskBlast to where it is today, the journey for the next couple of months is even more exciting. We wanted to wet your appetite with what features you can expect to see over the next 3 months. The order represents the order we plan to add the features. However, we wanted to invite you to add your support for a feature in the comments or even suggest new feature requests. If a feature gets a lot of support we will bump the position. Note these are not all the tasks planned, we will have lots of smaller incremental improvements to the app also but today we are focusing on the major features coming soon. We recently had some issues with slow loading pages, those are now resolved and you should see a significant increase in speed. The first load of a view might be a bit slower but after that, you should see a good improvement. We are not stopping there and have several more upgrades coming that should increase speed even further. When a task is created it will send out a recap to the assigned user. When tasks are updated it will also send a notification highlighting the most recent changes at the top. All emails will have the bug identifier and name in the subject and also a description of the type of task such as update, reminder, new task, closed task. Multiple emails will be avoided as we will now pool emails and send every 5 mins, filtering out the duplicates so if you make several changes to a task right after creating it only one task will be sent. Time tracking was recently added but there will be major improvements coming over the next couple of weeks. The new time tracking widget will be added within a week. This will allow you to see the active timer from any view and quickly switch to another task. The time tracking Tab will remain which will allow you to review and filter your own personal time clocked but this will be the new control center for clocking time. If you don’t use time tracking there will be a setting to turn this off. This will also get some love with more filters, remember and save filters along with support for multiple project filtering. You will also have more control over who see’s specific data but we will discuss that in the roles and permissions feature below. We are adding two new slack improvements we hope you will like. Send notifications and a brief recap of closed and newly created tasks to a slack channel of your choice. Things have been moving so fast that we have struggled to keep the documentation updated, expect a much-improved FAQ, video and help system over the coming days and weeks. Once clicked the comment will be moved to a hidden section. However, resolved comments would still be accessible by clicking on the “show resolved comments” link. That would expand a 2nd comment sections showing all the previously resolved questions. You can reopen a resolved comment also and it will move back to the original comments section. Drag and drop has already been implemented but will be improved very soon as it is currently not that intuitive. Changing the sprint start and end date will automatically update the Gantt chart. 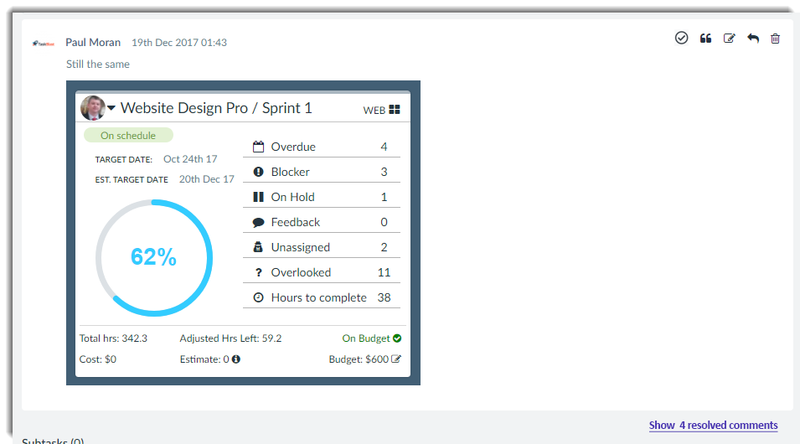 Ability to move the sprint start and end date by dragging the sprint bar on the Gantt view. Better recalculation of data. 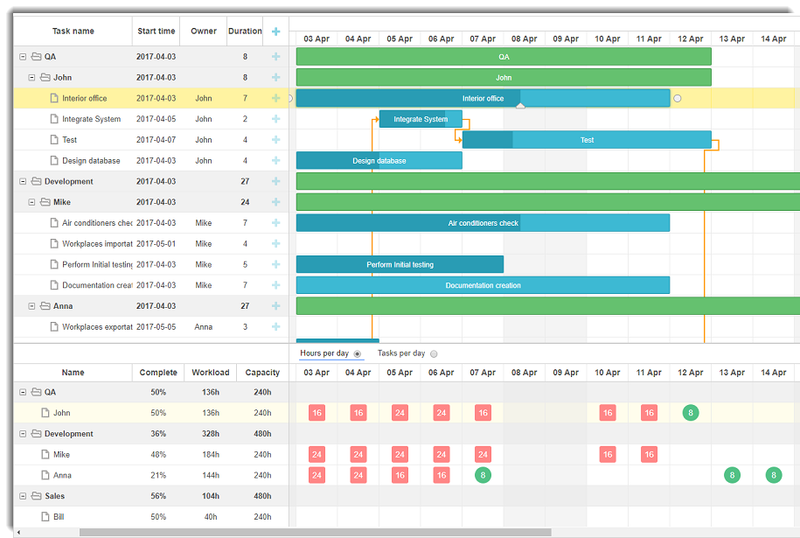 As you adjust the Gantt bars, the kanban attributes for calculating the time left etc will update instantly. Hours clocked and hours left will be added to the Gantt left side table. Subtasks will be grouped under the parent task in a folder. and various other improvements will be added. We will also show you some resource management data directly on the kanban when you are assigning tasks so you can make sure the workload is distributed more evenly. Right now when issues are closed they disappear from the Kanban view. To access them you need to set the filter to closed and it leaves the process a bit disjointed. Now closed tasks will be shown in a new closed items lane which will be collapsed by default. To access closed items simply expand the lane. However, we plan to expand those permissions quite a bit. Here is a recap of the new permissions. The high-level project overview will drastically reduce the amount of time it takes to give someone a status update on several projects. Updating tasks and following up on issues was really seen as a core duty of a project manager’s day. However, a lot of it can be automated. One of the most important things that a project manager needs to do is stay on top of issues. As issues approach their due date we need to know if they are still on track and if not what can we do to help get it back on track. We need to know the status of overdue issues, blockers, why nobody has picked up unassigned issues etc. 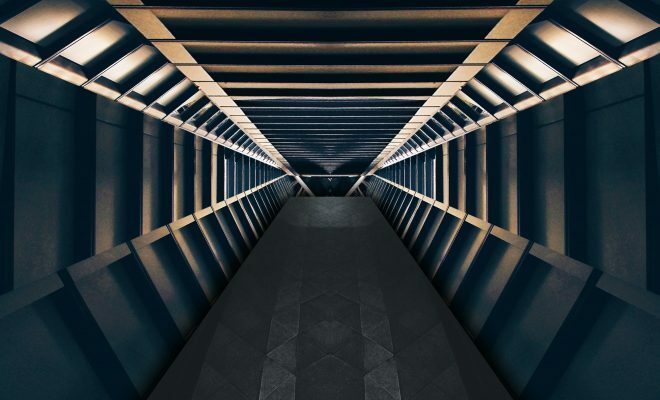 Approaching due date – TaskBlast sends a comment to everyone assigned to the issue 2 days in advance of the due date to ask if everything is on track and if there is anything that might hold it up. This makes you proactive by addressing issues before they become a problem instead of after the bottleneck has already occurred. This type of proactive reach out can make a significant difference to your deadlines. Another example – tasks with no assigned user. 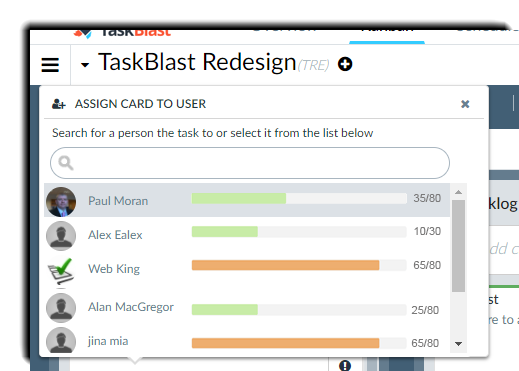 TaskBlast will look for the users with the least tasks on their plate and display a list of unassigned issues and see if they can take any which are suitable. This reduces the time spent following up with various people to see if they can take on a task and unassigned issues will never move so addressing this could again potentially have a very positive effect on your deadlines while also freeing up valuable time for you to work on other important tasks. The last example would be overlooked issues. Issues that have sat in a lane for more than a few days without any updates. TaskBlast’s assistant would bump any of the assigned users and ask them for an update on why the issue has not been updated in x days. Once again, we are being proactive and addressing issues before they become an issue all while the project manager is off working on the things that really matter and not spending time on tedious tasks. The concept is simple, identify what issues slowed you down during the sprint/release and put a plan in place to prevent it from happening again. This introduces a continuous cycle of improvement and increases the velocity of the team. The problem is with a large sprint it can take time to review each issue individually to see if there was anything that stood out about that particular issue. 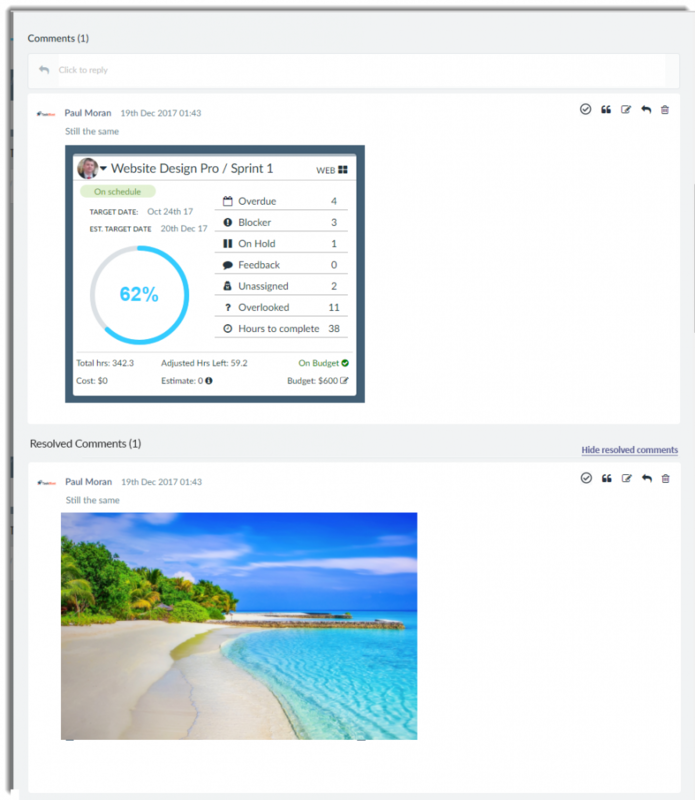 What TaskBlast does is check the logic for what should flag an issue for discussion and display it in a view like which again reduces the work of the project manager or scrum master. On the left is the list of flagged issues and on the right is a list of bullet points of actions to implement in future to prevent a similar issue occurring. You can open an issue directly from this view to get more information. TaskBlast will provide a pre-configured list of triggers that flag an issue as a potential issue for discussion however you can adjust the triggers to decide yourself what the triggers should be. This gives you much more control over the number and types of issues shown. 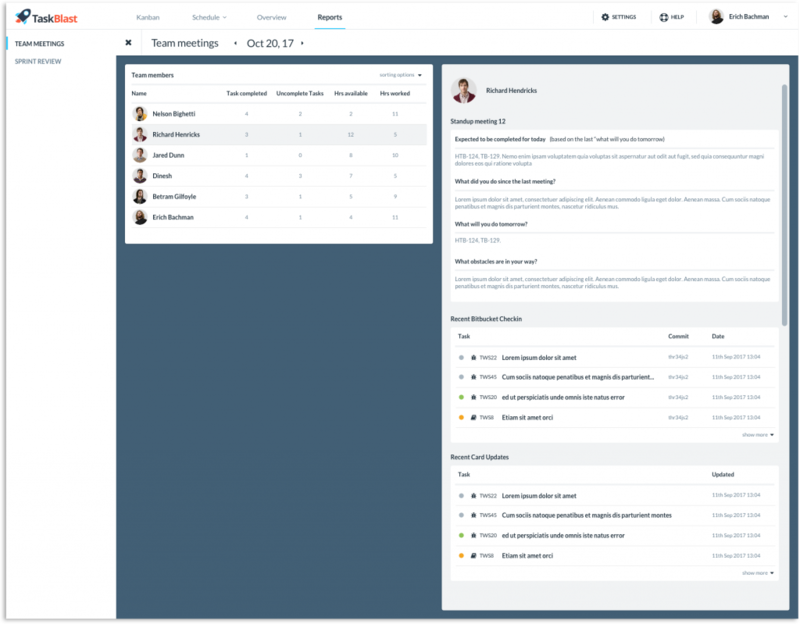 The team view is for managing stand-up meetings but also can be used to get an overview of progress for individual team members. On the left, you see basic stats on how many tasks the user has completed in the selected period. If you select a user then the right side will display information about that user. They can talk about what they have done since the last meeting, what they plan to do today and what obstacles are in the way of them making progress. It also will sync with your favorite git tools such as GitHub and BitBucket and extract any recent check-ins as well as displaying what issues you worked on in TaskBlast also. 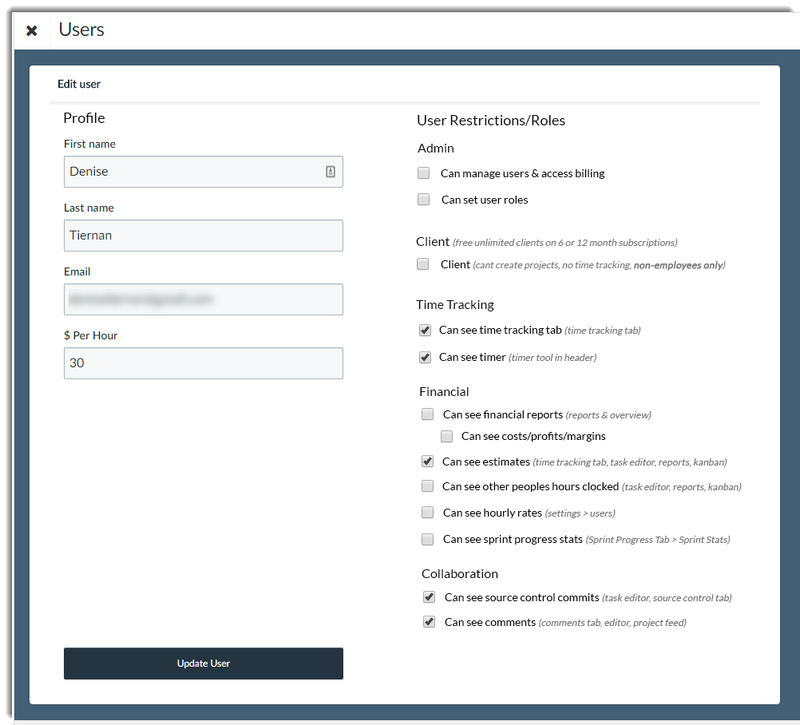 This allows the user to quickly refresh their memory on what they recently worked on and can then fill in the stand-up meeting info based on this. It’s really a good blog on roadmap software. I appreciate your article. Its important to get quality information about roadmap software. This blog is really helpful to give a light in this issue. So thanks for sharing all that important information.